Every family or business deserves a dependable water heating solution. It’s something you rely on every day, but it should also be the least of your worries. Berwic is here to help you replace your old unit with top­ of­ the ­line products from renowned manufacturers. The Berwic family is driven by only one thing: you. Safety is Our Priority – As a proud member of the Alberta Construction Safety Association, we ensure the safe, fast, and efficient replacement of your water heating system. Access the Latest Cutting­ Edge Systems – Our team is proven and tested to handle boilers, hot water tanks, and other water heating systems of any brand. 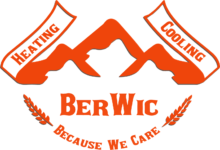 Dependable Service Guaranteed – Here at Berwic, we guarantee your unit has maximum power, efficiency, and longevity. Not only that, we offer a 24/7 emergency hotline to members of our preventive maintenance services, ­­all with zero added costs. Keep in mind that the quality of your water heating product is only a piece of the puzzle. As a consumer, you should also value your peace of mind, convenience, safety, and return on investment. If you require fast and reliable water heating replacement services, call us at (587) 275-­4822 and get started today!